Kendall's managed to wrangle her grandmother's house free and clear except for the rules. No male roommates. But that's okay; with the right ad, she'll pull in some girls, their rent, and, if she's lucky, she won't have to go to work any time soon. For their part, Anna, Lelani, and Megan all have their reasons for wanting to move in: Anna has got to get out from under her overprotective parents; Lelani can't take another day in her aunt's tiny crackerbox house overflowing with toddlers; and Megan needs a place free of her current roommate from Hades. Though they come with assorted extra baggage filled with broken hearts and dreams, they will discover they also have a vast array of hidden strengths. As they struggle to become the women they want to be, they'll find new hope, and maybe even Kendall will learn a thing or two about life, love, and the true meaning of friendship. Pay another visit to 86 Bloomberg Place. I love this story. It isn't something amazing or world changing, but after reading this series I miss the girls. I feel like I am one of them, and sometimes that is what I look for in a story. That aside this narration was okay. If you have a Spanish speaking character, perhaps you should learn how to pronounce the words written. For example: mija is not pronounced mejia. Would you try another book from Melody Carlson and/or Brooke Sanford? I really enjoyed Brooke Sanford's reading of the book. I think Melody Carlson has potential, but the story and characters seemed under-developed. I would listen to Brooke Sanford again. 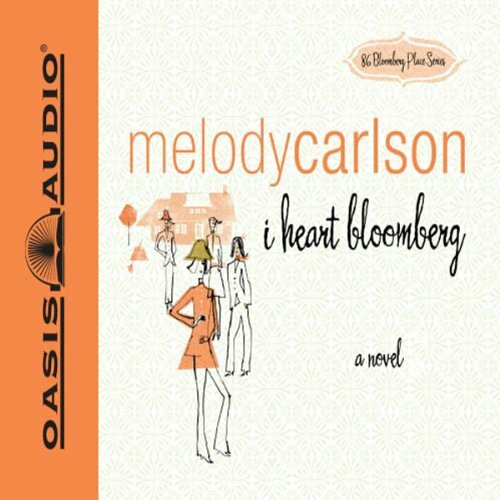 Would you ever listen to anything by Melody Carlson again? I might give one more book a try, but if the next one lacks the character development that I enjoy, then probably not. Have you listened to any of Brooke Sanford’s other performances before? How does this one compare? What character would you cut from I Heart Bloomberg? Kindle. I would either cut her, or develop her further... she kinda fell flat for me.